If you haven't heard about this fundraiser, this is way too much fun and for a great cause. Nike and the Michael J. 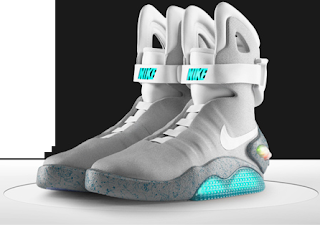 Fox Foundation have partnered to release 150 pairs of Marty McFly's MAG sneakers. The "Back For the Future" fundraiser consists of an eBay auction with the net proceeds going to Parkinsons research. It only runs for 10 days, from Sept. 8-18. The first pair sold for $37,500. What a great way to raise funds for an important cause!